Best Beach Tents Reviews 2019: Various people like to visit the beach in the summer season. Hence, they spent their weekend with family on the beach. Are you also planning to go on beach this summer? If yes, then it is very much essential that you protect your skin to get tanned from Sunrays. You can protect your skin by seeking out for shade. For this, you can purchase a beach tent. Beach tents are extremely comfortable and are built by considering portability and convenience in mind. 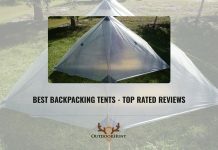 These tents are very much useful for highly fair skin. In summer, if you are exposed to the sun for a long time, then it may cause burns and risking sunstroke. When you have a beach bent, you don’t have to sacrifice your prime spot near the water so that you can keep your family secure. By this, you will be able to enjoy your summer along with enjoying heat for more time. Also, you will protect your family from harmful UV rays. Currently, various beach tents come with clever pop-up mechanisms which enable a quick setup. Other things to consider are size and price-tag, along with storage pockets and windows. There are a wide number of beach tents in the market. Hence, you might get confused about which tent should I buy? In order to resolve your issue, here we will provide you with Best Beach Tent Reviews. It is one of the best beach tents for families who don’t like to spend much time in setup and wind-up. The EasyUp tent has a wonderful design which is extremely user-friendly and enables you to spend time enjoying the sun. 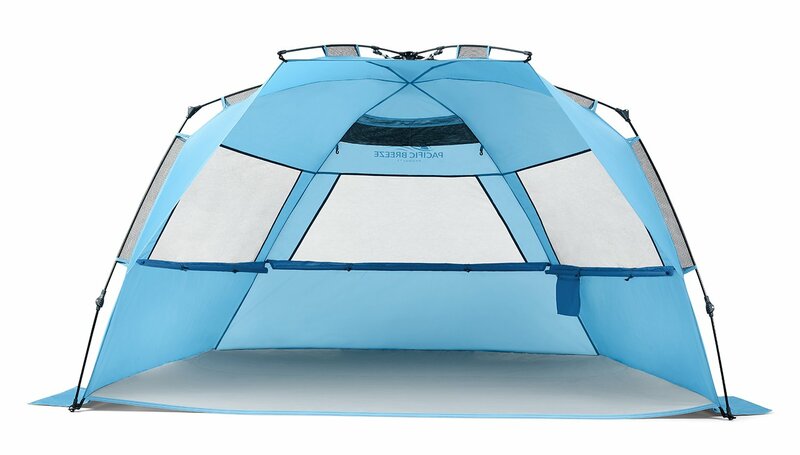 The tent is built from durable sky blue fabric which consists of a fiberglass frame and weighs around 4.4 pounds. It measures 87” x 47” x 49”, and provides a great space for three people, and when folded it size reduced to just 40” x 5” x 5”. The EasyUp Hub System is highly useful as it uses smart drawstring mechanism which allows you to set up and wind-up tent in just a minute. This tent is not only a great option in summer but also in wind and rain. 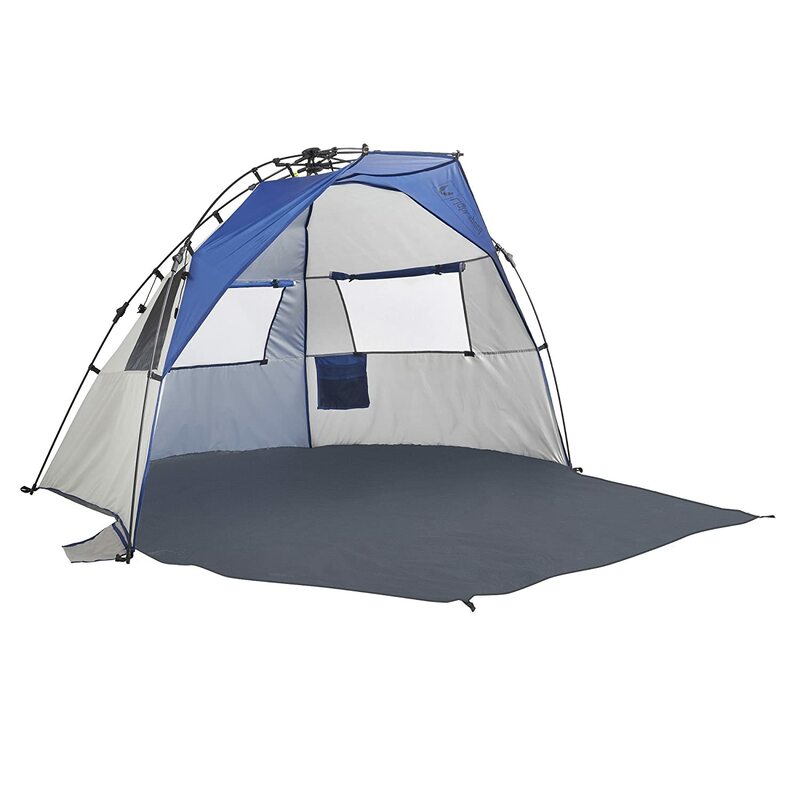 This tent can also be carried for outdoor activities such as soccer games or at a park. The tent provides UPF 50+ Sun protection which is essential for people with fair skin. During hot days, you can enjoy the beautiful view from the windows and also enjoy a cooling-through breeze. It possesses huge space to accommodate your family and also stakes, storage pockets to store your essentials. Lastly, polyurethane floor is waterproof, hence you will be able to install on damp sand and even remain dry. Lightspeed Outdoor tent is the best beach tent available in the market. It is well-known because it is very easy to set up and take down. Due to the compression hub system, the tent requires just a couple of steps to get the sun shelter ready. This tent also provides UPF50+ protection which is absolutely great for you and your family. It consists of 8.5mm thick fiberglass poles which makes sure that the sun shelter is durable and stable. The tent features a waterproof surface, which works well in case of sudden precipitation. Apart from just the internal tent, it features a porch space which enables you to take complete benefit of your surroundings. It consists of 3 windows configured with shades which allow enough ventilation without compromising on your privacy. Thus, you will be able to enjoy summer without any kind of limitations. Lastly, the whole tent package consists of a highly oversized carrying bag, Sand pockets to protect your gear and 8 stakes. The tent comes with a 1-year warranty. Coleman Beach tent is best for anyone who doesn’t like a big tent which takes a lot of time to set up and pack up. In order to set up this tent, you are required to connect some cords, fix some sticks on the ground, and it is ready. It is basically a portable pop-up beach tent with 50+ UPF sun protection. The tent consists of 3 poles which slide into the sleeves for a quick, 10-minute setup. Don’t worry because the tent has 3 poles, there is nothing complicated about it. Sometimes many people feel that it’s difficult to set up a pop-up design, however, a pole style canopy provides a highly stable setup. You don’t want that your tent gets blown away by the force of the wind. Hence we highly suggest you buy a beach canopy, very good little carrying bag, a sandbag, a floor mat, and a drying line to keep your wet clothes so that you don’t need to keep them in the sand. While listing best beach tent reviews, Pacific Breeze is one of the most popular firms developing beach tents. Here, this beach tent provides a lot of interior space capable enough to occupy 3-4 people. The extra-large tent doesn’t increase weight and its weight is just 6.5 lbs. 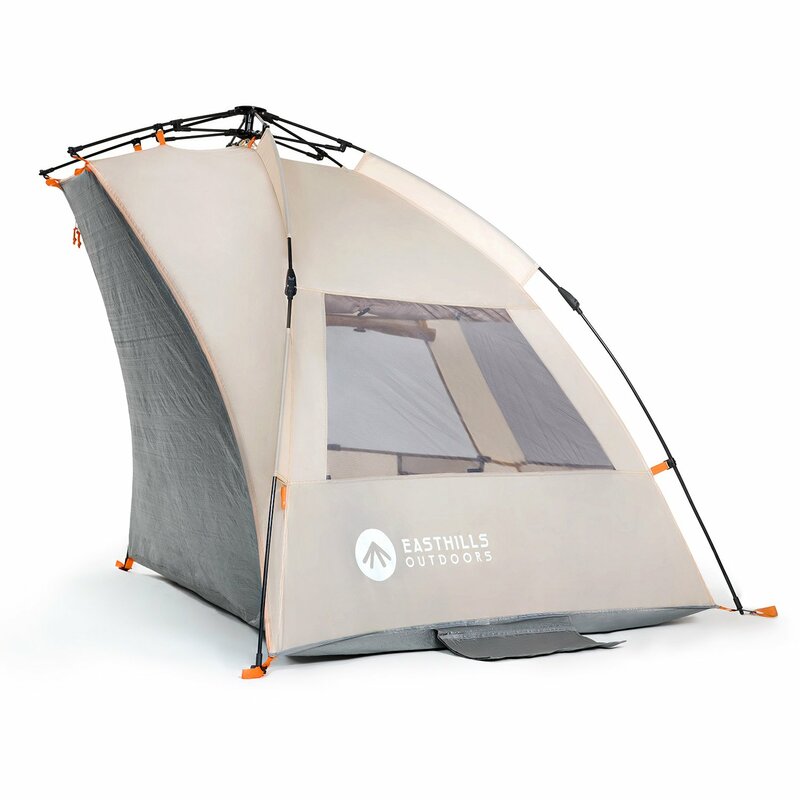 This tent provides an easy to set up feature just like the small tent. The compact beach tent when folded turn into a suitable travel size which is simple to carry because it is lightweight. It consists of UPF50+ protection, hence it protects you and your family from the sun, rain, and wind various other outdoor activities. It is highly breathable, thus making it useful in warmest days. Due to large windows, you will have great ventilation and airflow inside the tent. The tent consists of 5 sand pockets thus allowing you to store enough of your gear. The package consists of carrying case which allows quick transportation between the car and beach. Lastly, the tent is available with 1-year warranty. This is one of the best beach tents available in the market which will protect your whole family. Due to its unique design, this tent can be setup in just a few minutes. it is lightweight, hence you can easily carry the tent anywhere. This tent will cover all the three sides, then also you will be able to enjoy the sea view. It is easy to set up this tent because it doesn’t provide a lot of features. However, what you expect from this price. In case of wind, fill the sand pockets, so that your tent doesn’t move. The tent is built from zinc coating over a polyester fabric. It has UPF30+, hence it blocks 96% of sunrays and harmful UV rays. It provides great ventilation. This tent falls under our list of Best Beach Tent 2019. A large number of people are going crazy about this all-weather portable tent. The tent provides UPF 50+ protection, hence it keeps your skin safe and protects you from UVA and UVB rays. Anyone who is searching for special summer tent should purchase this tent immediately. The tent comes with side panels and wind flaps which offers more protection along with great ventilation and airflow. This beach canopy is best suited for kids sporting events. The tent has an 8-foot canopy which is built using 210D polyester, hence it provides all-weather protection. 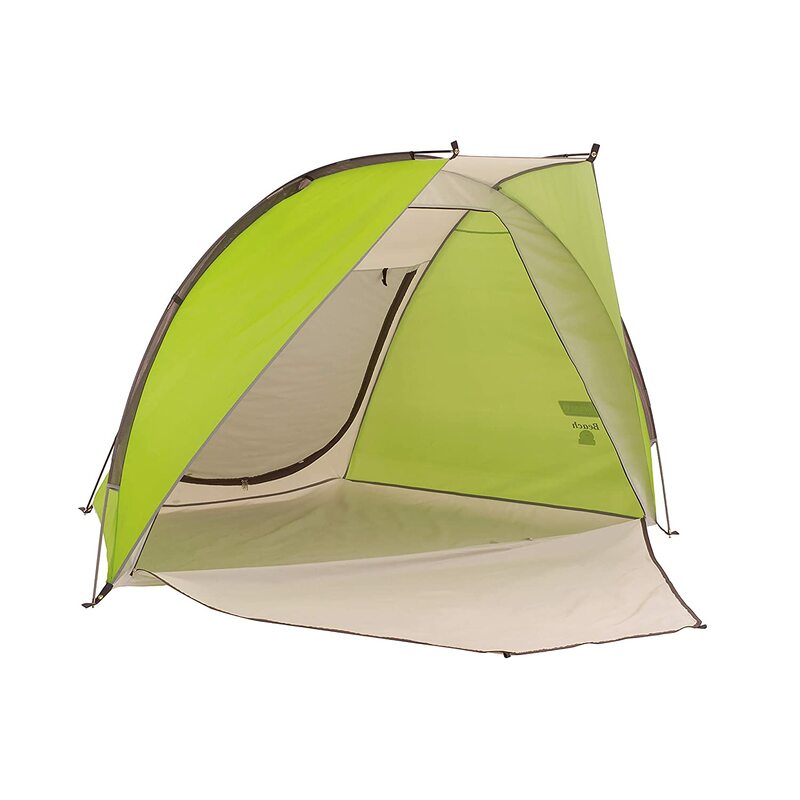 This tent looks similar to an Umbrella, with two sides on the ground forming a safe tent-like structure. This is an incredible option for families looking for a quick-to-setup tent. 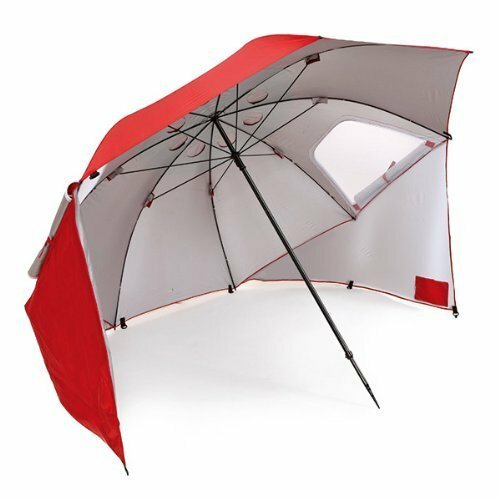 Sport brella tent is good enough to protect from rain, wind, and sun. The tent also consists of a window; hence it provides great airflow and visibility. Umbrella tents come with a full package which consists of 3 tie-down cords and 8 stakes to provide the best protection. This beach is recognized especially due to its attractive blue color, hence is most suitable for a bright day at the beach. It is great shade protector at the beach for many days due to the 190T polyester which is breathable, waterproof and protective. This tent comes with UPF 50+ protection which is suitable to keep your family safe. The tent comes with a dome which provides an extra layer of protection from the sun. It comes with UPF 50+ protection, which is suitable enough to protect from a minimum of 98% of UVA and UVB rays. It consists of 3-extra large B3 mesh windows properly installed on the two opposite sides and back of the tent for great ventilation. 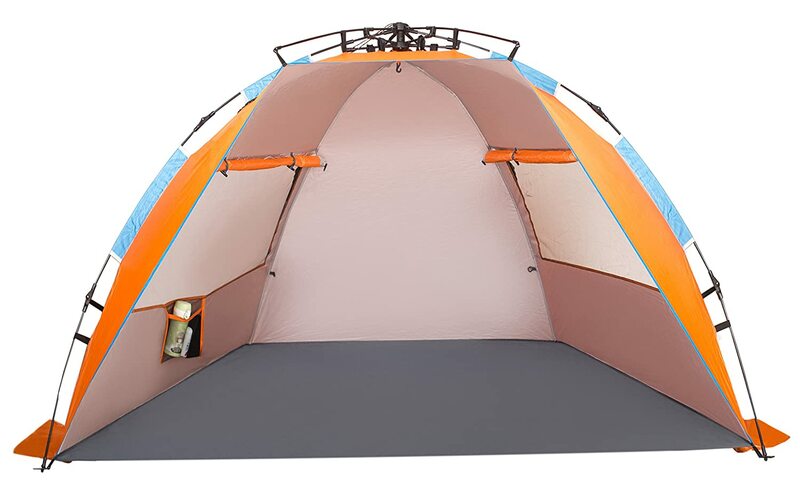 The tent features an inclusive ground cloth which is available with quality plastic and electroplated zipper which is rust free when it comes in contact with water. The tents include 6 stakes so that you can strongly set up the tent. It can easily occupy 4 adults or 2 beach chairs inside. Even though it is big enough, when folded you can easily carry it anywhere. It comes with 5 sandbags; hence your tent will remain still in high winds up to 25 mph. The tent comes with 4 storage bags which are sewed over the 4 interior corners where you can store your devices such as tablets, smartphones, etc. This unusually shaped beach canopy has an extended porch for more space to move easily. Anytime you require more space for changing clothes, eating or napping, the extended porch gets closed easily to make beach canopy full enclosed for privacy. Despite being made from polyester; the beach tent is not only waterproof but it also has UPF 50+ to protect from harmful UV rays. The tent uses an Easy Setup Mechanism and comes with detailed instruction sewed inside the carry bag, thus it is very easy to setup and roundup. The weight of this tent is just 5 pounds; hence it can be easily carried anywhere. The tent features windows on all the three sides, hence it provides great ventilation, thus enabling the beach tent to be filled with fresh air. It also consists of 4 internal pockets to store all your personal items. Under $80, you will get this type of beach shade canopy. It consists of a carry bag including shoulder strap, 10 plastic stakes, 4 guy lines, and a storage pouch. If you are looking for a big beach tent which can occupy 4 persons, then go with this beach tent. The big space provides relaxing cooling shade to the workers residing inside it. The tent comes with automatic patented pop up mechanism which is quick and easy to set up and fold back under one minute. The tent consists of a strong and durable umbrella which is made from breathable 210T polyester, and it protects 99% from harmful UV rays. It features 8.5mm fiberglass poles which provide additional stability using stakes and guy ropes. The tent consists of two windows for enough ventilation and air circulation. The tent consists of a large interior shelter and an internal pocket to store your valuable items. The package consists of items such as 1 carry bag with shoulder strap, 6 sand pockets, 8 steel stakes, 4 guy lines, and 1 storage pouch. As compared to other tents in the market, Super-Brella doesn’t consist of a floor. It is basically a combination of tent and beach umbrella. The tent is designed like a beach umbrella. The tent is made from 190D polyester in order to provide all-weather protection. As the tent consists of extra portions, which results in a portable beach shelter. It comes with UPF50+, hence it protects from harmful UVA and UVB rays. It comes with side panels for additional coverage and wind flaps which provide great ventilation and airflow. This tent protects you from wind, rain or sun. The water repellant design keeps you dry in monsoon or warm during hot summer days. The package comes with a carry bag, 8-steel ground stakes, and 3-tie-down cords. This tent falls under our list of Best Beach Tents 2019. Why? Because the tent is highly reliable. You can easily set up this tent within a few minutes. This tent can be used as a sun shelter, beach shade or beach canopy. 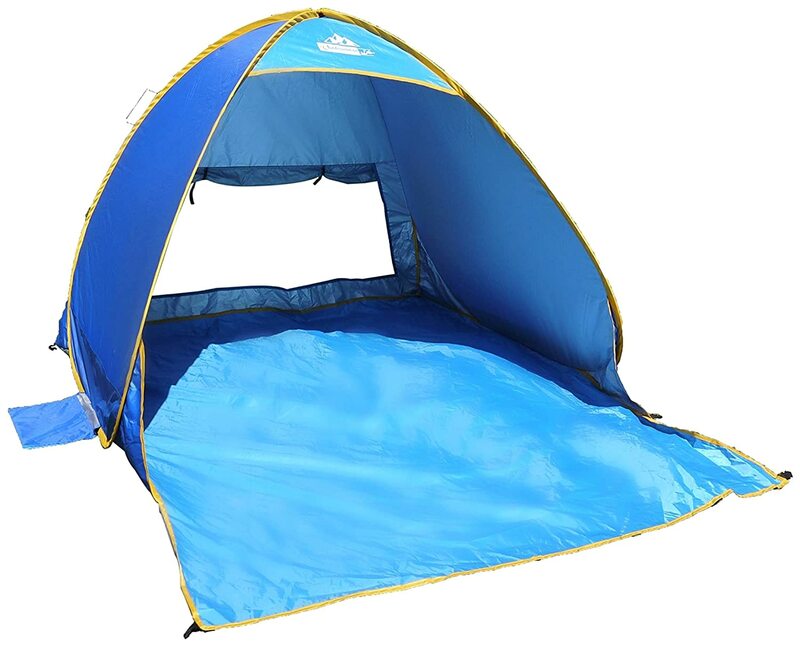 It is a lightweight tent which is extremely portable, hence you can easily carry at the beach. The tent is especially for those people who want to spend their whole day at the beach. The most amazing feature of this tent is the automatic assembly. Due to this, the tent folds into the place immediately so you can enjoy. Also, you can set up this tent in just a few minutes and it is simple to carry anywhere you want. The tent provides a good proportion of sun-blocking, hence it provides optimal protection from UV rays. It consists of a large mesh opening for great ventilation. Even though it is lightweight, it can withstand heavy wind. The tent features additional sand pockets in order to remain still and provide you the best experience. It features hand straps and backpack straps; hence you can easily carry it anywhere you want. This tent is suitable for anyone who is struggling to carry a tent from one place to another. The tent features a multi-functional carrying bag with large pockets. Other accessories included in the tent include beach canopy, sun shelter, cabana protection, double sleeping bags along with a carrying bag useful during cold weather. If you are looking for an affordable beach tent, then this is the best beach tent available in the market. You just need 30 seconds in order to setup this tent. The tent provides great space; hence you can enjoy with your family. 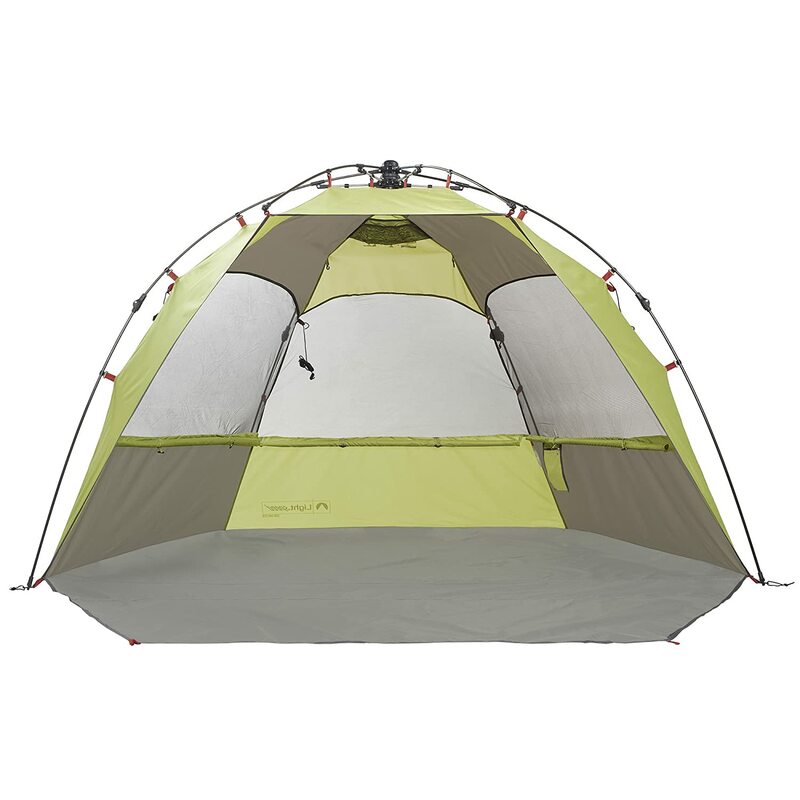 The mid-size tent provides excellent protection and it is loaded with features. It can easily accommodate three adults. The tent is quick-to-setup due to pop-up fiberglass frame. To set up, just throw the tent in free space and let it unfold. Also, this frame is safe, durable and rust-free. The tent has UPF50+, hence it protects from UV rays, and it also consists of water-resistant fabrics for walls and floor. Backside mesh offers great ventilation. It also consists of 3 sand pockets, 4 extra sandbags, and 4 stakes to provide the best safety. It can easily withstand wind having a speed of 25mph. 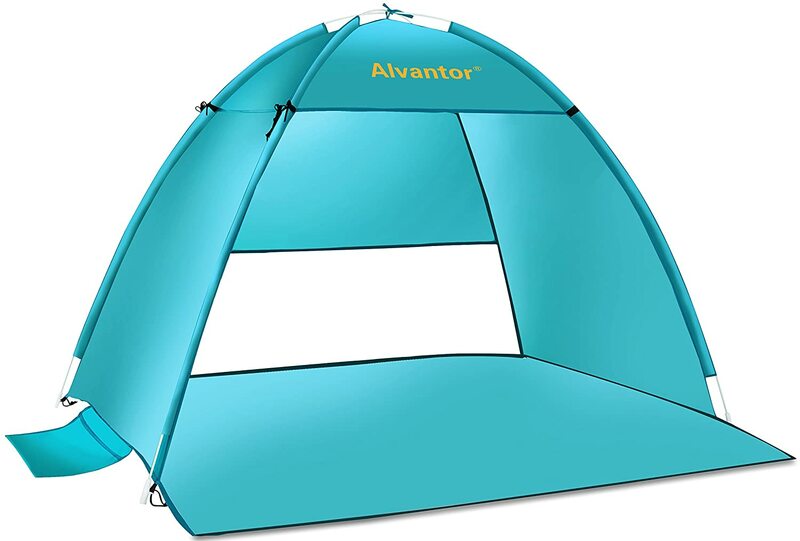 Alvator Pop up tent is highly lightweight, weighing just 2.5lbs as soon as it is packed in handy carry bag. The tent has 8 figure design, so you have to just twist it down and it fits simply into your carry bag. It can easily occupy three tents and has a lot of space to occupy the whole family. Lastly, the tent comes with a one-year warranty. While listing best beach tent in the market, and not listing G4Free is unfair. The G4Free tent is a safe tent for you and your whole family. The tent provides a lot of space for kids to play inside the tent. The tent is highly durable and roomy as compared to various other tents available in the market. The tent can easily accommodate 4 adults along with having space for kids to play. In order to set up this tent, just throw it in the open space on the beach and it will open fully erected. It is built from 190T waterproof polyester. It comes with UPF 50+, hence it protects from sun, rain, and wind. You can use this tent for different places such as a beach, sporting event, park and also in your backyard. The weight of this tent is just 4.25lbs, hence you can carry this tent anywhere you want. It consists of 8 sand bags so that tent can withstand extreme weather conditions. It also consists of 2 doors and 2 windows for proper air ventilation. If you are searching for a big tent, which provides proper shelter to your family, then this is the best beach tent available in the market. This tent can easily accommodate a few adults and still have some room to store your essentials. 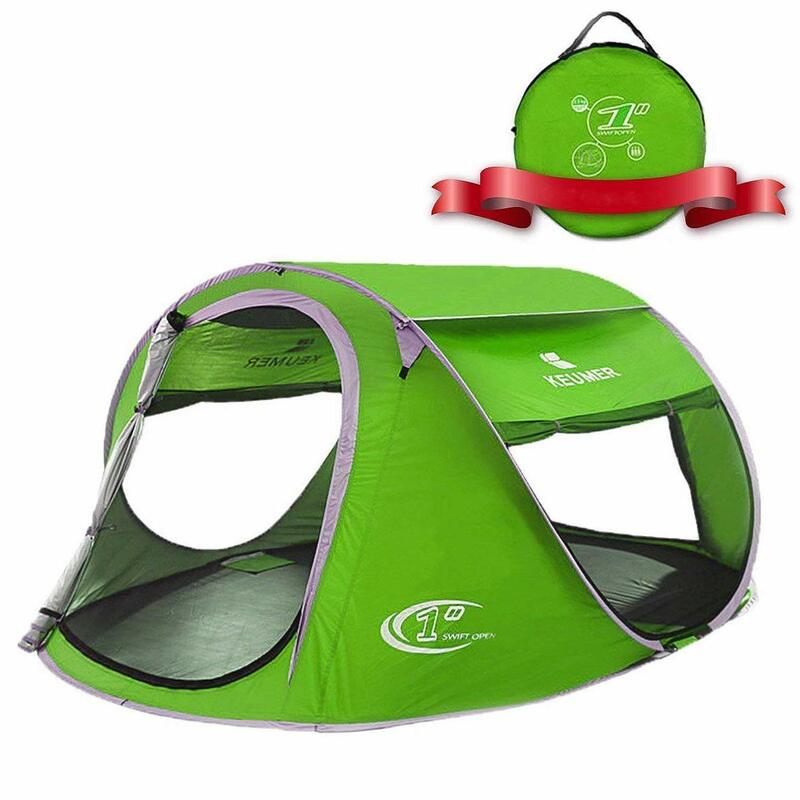 This tent is best suitable for camping in proper weather and it is also a great gift for kids in playhouse and sun shelter. If you want a tent which provides good shelter, then go with this tent. This tent can easily accommodate three adults, and can also occupy four, based on the size of the person. Zomake Pop Up tent is very easy to set up. In order to set up this tent, you have to just unstrap the tent, throw it in the free space and watch it open. Here, you don’t have to get stressed out with poles or complicated instructions. 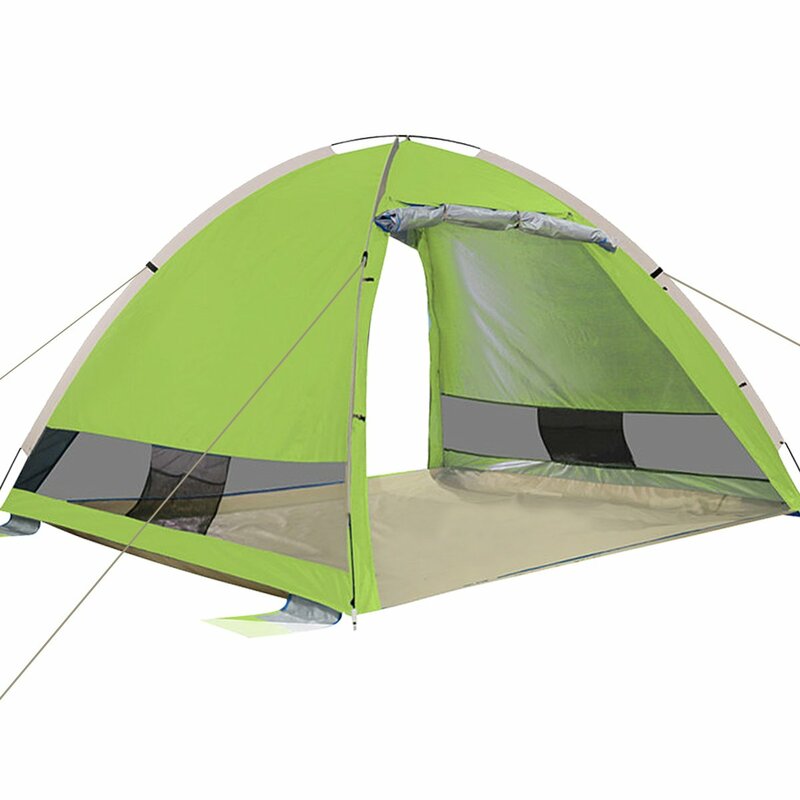 The tent comes with 2 mesh windows and 2 mesh doors. These doors are great for proper air ventilation. Also, you can sit inside the tent and feel the breeze through these doors. Also, it keeps the bugs out if your beach has any problems with insects during the evening. It is highly durable as it is built from 190T anti-UV polyester fabric. It comes with UPF50+ Protection, hence it protects from harmful UV rays. 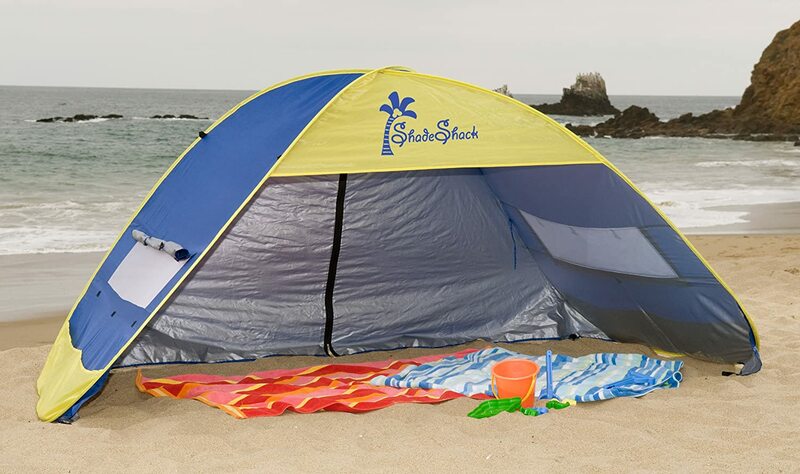 If you want a good tent for your family at the beach, then you can go with this tent. While listing best beach tent reviews, here we have come up with a tent which is extremely reliable as well as useful. 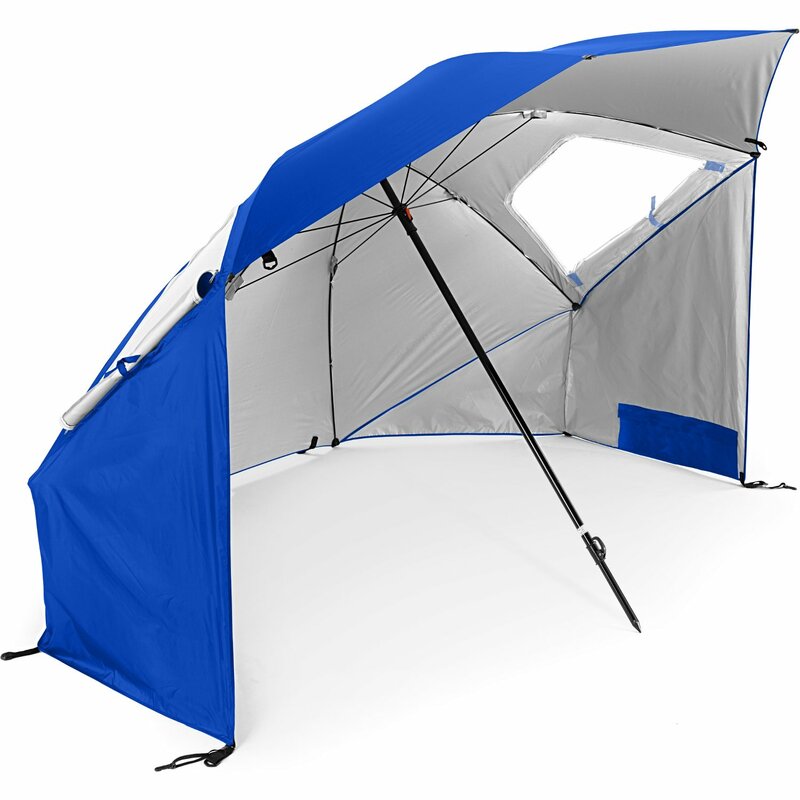 Lightspeed Outdoors Sun Shelter is a great option for all the people who want to stay away from the sun. The tent consists of easy up and down patented side-pull hub system, hence it is the fastest of all beach cabanas available in the market. Anytime you want to protect from the sun and experience a cool breeze, you can take help of this tent, as it provides a big canopy. Also, you can comfortably relax inside the tent. Lightspeed Outdoors sun shelter is a lightweight tent, weighing only 7.26lbs, hence you can carry this tent anywhere without any issue. It comes with 3 big mesh windows which provide very good ventilation. Also, it consists of a dog and kid polyoxford floor and a thick 8.5mm fiberglass poles for great stability. It also has umbrella rated 600mm PU coating for the rainy season. Due to its unique design, you can easily pack up this tent in just a few minutes. The package comes with a very big carry bag in which you can store anything you want. The package includes sand pockets, big stakes, and guylines. The tent is very big; hence it provides a lot of space to spread out while hiding from the sun. There is a great space to lay down and you can close the vestibule when you want more privacy. This is a great tent as per its features, however, there are some drawbacks which you don’t like. The mesh windows available in this tent doesn’t have a zipper, hence they stay as it is. You might find it difficult to use this tent in extremely hot conditions. A lot of people love to enjoy hot summer days on the beach with their family. Your love for the beach doesn’t fade away after having kids. Offcouse you will require some prior planning before going for the beach with your family. When you will have the best beach tent, you will be able to spend the majority of your time outdoors. For a great family picnic, you will require a beach tent which provides enough shade to enjoy on hot summer days. A portable outdoor beach tent will provide very good outdoor experience and keep you secure from bugs and other elements. These tents are useful for a lot of wonderful purposes; hence they are ideal for hot summer days. It will be the best investment, as summer beach tent will inspire kids to play outside, thus reducing their screen time. Here is a list of important factors which you should consider while buying a beach tent. Different firms use different materials to make the outer shell of the tent. The two most popular type of materials used are nylon and polyester. Both these fabrics are of great quality and are useful to form the shade. Also, they are durable and long lasting. Several tents include openings which enable airflow when the wind gets strong. The closure of the tent should be built from good-quality zipper or ultra-strong Velcro. Hence it provides protection from strong winds and also from bugs at the time of eating lunch. The feature to close your tent will add one layer of security while you are in the water. The frame of a tent should be built from lightweight but strong material. This is possible only when it is built from aluminum or steel, as it protects from rust and corrosion. The major factor which you should consider about the frame is how much wind will be there on the beach. Aluminum frames work well for beaches in case of light winds. While steel frames are somewhat heavier and great for strong winds. How many persons should comfortably fit inside the tent? Majority of bents are built to accommodate two adults and one child. Instead of just thinking about the seating space, you should keep in mind that your kid doesn’t like to sit still and will require some area to explore or play. Several tents are wide enough to occupy some beach chairs and a table. Keeping in mind the size of the tent which works best for your family is essential. Beach tents are available in different sizes and shapes. The size of your tent is directly proportional to the number of persons. A group of 5 people will require more space compare to two persons. Different style of beach tents will have more space, hence there will be room for more people and assets. One other important factor which you should consider is the height of the tent. A tent should have enough height so that you can comfortably sit inside it. It is a very essential feature when you are going with younger kids on beach. You would like to make sure that the tent is easy to carry from one place to another. Also, you want to make sure that the tent is quick-to-setup in just a few minutes. Pop-up tents are simple-to-setup, just require a few minutes. Pole tents require more time, however, there are a lot of tents which require less than 2 minutes. 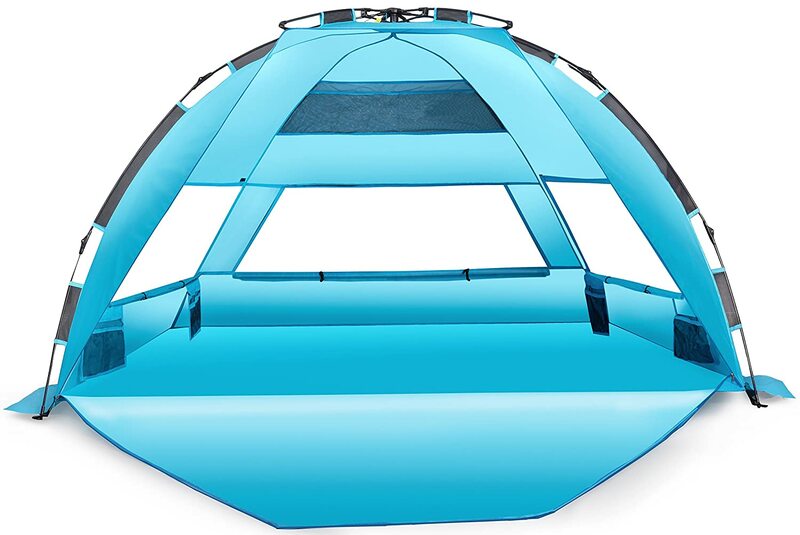 Majority of tents are available in a variety of summer colors. Hence, you have an option to select the best color for your tent. Many times, tents are available in bright summer colors. Due to a lot of options, you will be able to select the best color tent easily. It is highly essential when you have little ones on your toes. You require a tent which is quick to transport from one place to another. Please note that your hands will be occupied with coolers, towels, chairs and your child. If you have a lightweight and compact tent, then it will be easy to carry anywhere. As soon as you have carried a tent at the beach, you will require a tent which is quick to set up as well as roundup. The weight of a tent is mainly dependent on what type of tent you choose. Beach canopy tents are lightweight as well as compact. Unfortunately, most of the firms make sure that the tent has a lightweight structure which will be beneficial to you. You also have to make sure that it is easy to set up and pack up the tent. You must choose a proper budget for your tent, based on your requirements. By this, you will have a clear idea about how much you are going to spend on a tent. This will limit your choices and you will feel more confident about your purchase. It is always good to check the prices of the tent so that you have a clear idea about prices. The three most popular type of beach tents includes Pop up, Cabana and Canopy. These types of tent have the same shape just like the dome tent and can be set up in just a few minutes. You can pack up this tent within a few minutes. These tents are lightweight and simple to carry. To increase stability, you can fill up the sandbags. These tents are several times more expensive than other tents because of ease of comfort. These tents provide proper shade while providing a clear view of the beach and ocean due to a big opening on one side. Majority of cabana tents are zipped closed for privacy. They are highly comfortable and possess a self-erecting feature. These consists of a nice SPF coating and more sun protection. If you have a large family or a bunch of friends who love to enjoy hot summer days at the beach, then a big canopy pop up tent is the best option. Here, a small canopy tent can occupy 2-3 adults. While a large canopy tent can easily occupy 8-12 people. Apart from the above three tents, there are also baby tents targeted mainly for kids. These tents are designed in a way to provide shade to the smallest people. As these are meant for kids, they are built from high-quality material and can be used at different places apart from the beach. These tents can be used in the backyard to protect your kids from the sun. Some of the most important benefits of having a beach tent are listed below. A proper spot to store your tools is necessary. Majority of tents consists of pockets which are mainly used to keep things like a camera, phone or keys. Apart from these, you can also keep your towels, water bottles, and cooler inside the tent and also protect your gear from hot sun rays. A secure tent for storing your assets will block all the people who might have wandering eyes when you are on the beach. This adds one extra layer of privacy which is good. The pockets in your tent will help you to maintain the life of the tent. Keeping it away from sand and salt will add years to the life of your tent. At the beach, you will be vulnerable to things like wind, salt, and sand sprays. If you have a tent, then it will provide shelter for you and your family. Carry it to a rainy sports game and enjoy on sidelines along with keeping your family dry. You are vulnerable to a lot of things on the beach, hence cover yourself with a beach tent. By this, you will be able to increase your privacy, take a nap or just protect yourself from different weather conditions. It provides a lot of space to store your foods and other tools. Also, it keeps your food fresh. Moreover, you can keep the water cool and food away from sweating. Majority of tent consists of floors; hence you can keep food clean and away from the sand. Beach tents are useful for families as they provide a lot of advantages to kids. Apart from strong sun rays, the sand can also become hot, hence it is necessary to have shade. The tent will also make your kids day for safe and memorable as he/she will have a place to take a nap or just take a break from hot sun on the beach. Which is the best beach tent for babies? Visiting a beach with babies needs lots of planning, preparation, and tools as compared to going for a solo trip. Due to their soft skin, it is very much important to protect all the kids from harmful UV rays. If you fail to do so, their skin might get burned. Selecting the best beach tent for your family relies on your personal choice. This is dependent on various factors such as climate you are living, the size of your family, and on your priority. All the parents know that it is very difficult to keep the child still at one place. Hence, we suggest you purchase a big-tent so that your child has space to explore and he/she is still protected. You will also require a beach canopy which can withstand any climate. 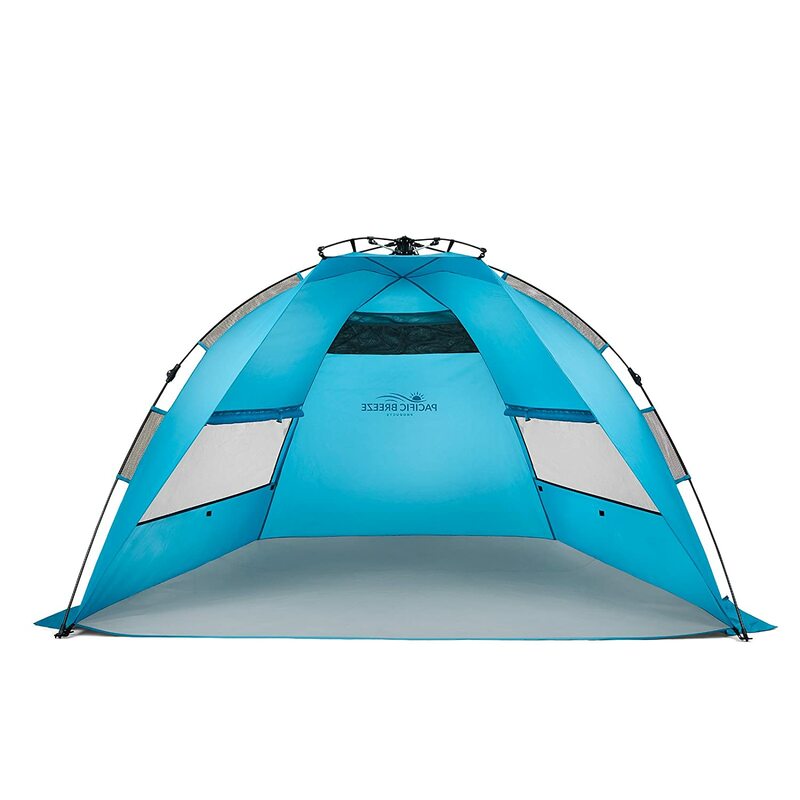 Here, the tent should withstand wind, waterproofing features, and also protect from UV rays. All the tent mentioned above works well to provide the best protection to your family. Out of all, Pacific Breeze Easy Up Beach Tent provides big space along with SPF50+ protection. How to fold a pop-up beach tent? Erecting a pop-up beach tent is easy while folding it might be difficult sometimes. Various manufacturers keep videos on their website or channel which allows you to setup or tear down their tents or beach shades. Best practice is to watch videos and try to set up your tent before going to the beach. What is the cost of Beach Tents? The cost of beach tent is dependent on the size, material, and also on the company that makes it. Price of a normal beach tent is between $150 to $450. Please note that you don’t have to spend a lot of money to buy a beach tent. How to stop a beach canopy from Blowing away? Various firms make a solid quality of beach tent so that it doesn’t fly away. Majority of beach canopies consists of pockets in which you can fill sand or rocks to keep it stable and secure. In case the tent doesn’t consist of pockets, then you can secure it to the ground using rocks at the tent legs. Also, if you are taking water for the whole day at the beach, then you can keep gallon milk jugs and join it with the legs. How to fold up your beach tent? At the time purchasing a tent, you must check how the firm folded it. Several tents consist of a bendable frame which is easy to bend. In other tents, fabric part is isolated so it can be refolded easily. By watching a video of how it is folded by the manufacturer you will have a clear idea about how it will fit back into the package. Can you sleep in a tent on the beach? Yes, you can definitely sleep in a tent on the beach. However, this depends on the rules and regulations of the beach you select. Generally, the majority of beaches permit people to sleep in a small tent on the beach. Please note, sleeping in a beach tent will become windy and chilly, despite being summer, hence you should always carry warm clothes with you. What type of tent is best suited for a beach? The most well-known tent is a pop-up beach tent as it is quick and easy to set up. The main purpose of beach tent is to protect you from the sun. Secondly, it should be quick to set up and pack up. According to facts, beach tents are mainly the scaled-down version of the regular camping tents. As here, you want beach tents for some amount of time, they are portable, lightweight and simple to erect. Moreover, these tents are cheaper as compared to the regular tents. After going through the above factors and best beach tent reviews, you should be able to decide the best beach tent for you. If you are still facing any issues in selecting, then you should refer user reviews on the shopping site. Lastly, we hope that you like our list of Best Beach Tent 2019. If yes, then please share it with your friends and followers. We have reviewed Top 20+ Best Beach Tents 2019 - There are a wide number of beach tents in the market. You can choose the best from here.